In an effort to build a stronger connection between our school & community, we ask our parents to volunteer 15 hours per calendar year. Anything a parent/grandparent feels that can contribute positively to our community, they do. One of our parents generously offered to cut our hedges in the front, as they were over growing. 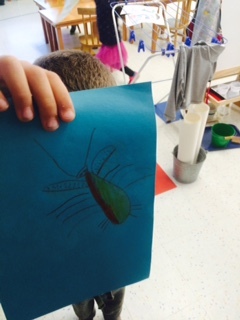 While he was beginning to trim, a 5 year old Kindergartner from one of our two Primary classrooms saw a bug in the bushes! 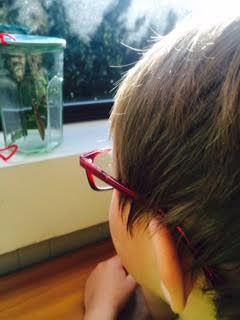 He alerted the teacher to the living creature and the teacher said, "it's a praying mantis, we have to save it!" She was able to think on her feet quick enough to get a glass cup outside, before it was too late. She asked the volunteer to collect the frightened praying mantis in the hedges. He obliged and caught it in the glass jar, as the 4 & 5 year old children watched intently through the glass window. The teacher was able to bring it into the classroom before releasing it back into a safe habitat. The children were mesmerized to see it up close and personal. What a great impromptu learning experience! They even drew pictures of it! If you're a parent of a Little Genius Montessori student and want to learn how you can help our school please give us a call at: 503.492.8500 or contact us by filling out our contact form.